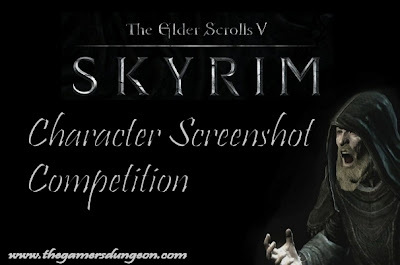 Lets hold a little Skyrim competition, which gives you a chance to present us your Skyrim character and best screenshot of him. Be creative, it doesn't have to be close up, it can be far shot presenting beautiful landscape, sunset or such, as long as your character is to be seen clearly in picture also. This competition is held by Gamers Dungeon (www.thegamersdungeon.com) -- if you're reading this article at somewhere else, I advice you to visit our page instead to take part. The competition will end 20.02.2012, unless less than ten partakers, which will extend period to take part to the competition untill 29.02.2012, when it will then end no matter how many sent their screenshot. I'm gifting some used Xbox and Pc games to winner and second place. One quality screenshot of your character. Don't send more. However try to keep size less than 2Mb to assure it gets through with the e-mail. Who he/she is (race, level, how you role-play your character, what are your main skills to focus, evil or good)? What your character loves (for example Nord ladies)? What your character hates (for example chicken)? Your choice of three games out of the "prize list" if you win (Max. two Xbox 360 games, read more below and see "the list"), this speeds up process to sort prizes for winners. Send all this to dungeoncall@gmail.com and remember, the screenshot counts most -- but we'd very much like to hear about your character a bit also! Competition ends in three weeks, at 20.02.2012 23:59:00 GMT +2 (Mid European time +2 hours). Maximum two Xbox 360 games, no other restrictions. By taking part in Gamers Dungeon competition, you give rights to use your Character's image in our Skyrim posts (we will be publishing the best screenshots in a blog post when competition ends, as well do we announce prize winners). However we are not using your personal contact information to any other purpose than mailing you your prize if you win. We don't use your real name when we announce winner, we use your alias, if your alias is same than the real name, it's the only case we do. Stay in touch after competition ends, I will be sending winners e-mail when competition is over to your provided "contact e-mail", if you don't respond within a week, then I may grant the prize to the next position winner. Also notice that prizes are to be posted from Finland, so reaching the States for example will take time, and I will play any costs regarding mailing. Prize list of the three games of your choice, remember, 1st Place picks first, 2nd Place picks of the remaining. Maximum two Xbox 360 games per winner. These games are used, thus some of them will have scratches and most don't have manuals. However I'm positive that every each should work fine. For older Pc games, use DosBox. Let's see how this turns out, hopefully we get some competitors so I can mail you my prize gifts.